We've been adopted! We're now named Mochi and Boo and we have a new canine friend named Winnie! Hi! If you are looking for double trouble, bunny mischief and cuteness--pick us! We are a super cute, spayed/ neutered bonded pair of brother and sister. 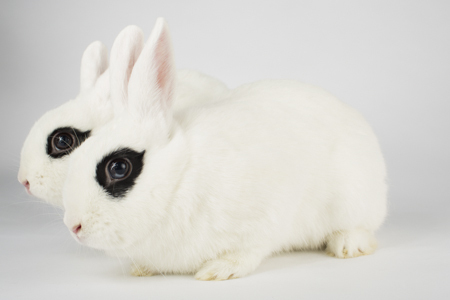 We are young (almost a year old)"hotot" bunnies with exotic permanent "bunny eyeliner." We're full of curiosity and are very active, so be sure to bunny proof your electrical wires and prepare for us view your home like a rock band on tour! We love each other very much and must be adopted together. Visit us soon and maybe we'll let you be a member of our fan club!